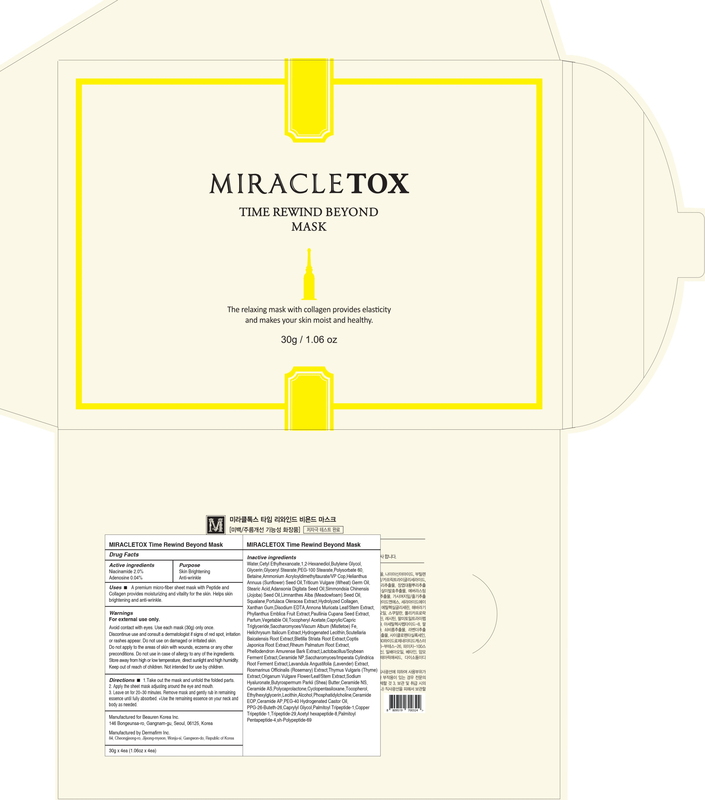 Proprietary Name: Miracletox Time Rewind Beyond Mask What is the Proprietary Name? Miracletox Time Rewind Beyond Mask with NDC 71619-240 is a a human over the counter drug product labeled by Beauren Korea Inc.. The generic name of Miracletox Time Rewind Beyond Mask is niacinamide, adenosine. The product's dosage form is patch and is administered via topical form. Warnings:For external use onlyAvoid contact with eyes.Use each mask (30g) only once.Discontinue use and consult a dermatologist if signs of red spot, irritation or rashes appear.Do not use on damaged or irritated skin. Do not apply to the areas of skin with wounds, eczema or any other preconditions.Do not use in case of allergy to any of the ingredients.Store away from high or low temperature, direct sunlight and high humidity.Keep out of reach of children. Not intended for use by children. Uses:■ A premium micro-fiber sheet mask with Peptide and Collagen provides moisturizing and vitality for the skin. Helps skin brightening and anti-wrinkle. Directions:1. Take out the mask and unfold the folded parts.2. Apply the sheet mask adjusting around the eye and mouth.3. Leave on for 20~30 minutes. Remove mask and gently rub in remaining essence until fully absorbed. +Use the remaining essence on your neck and body as needed.